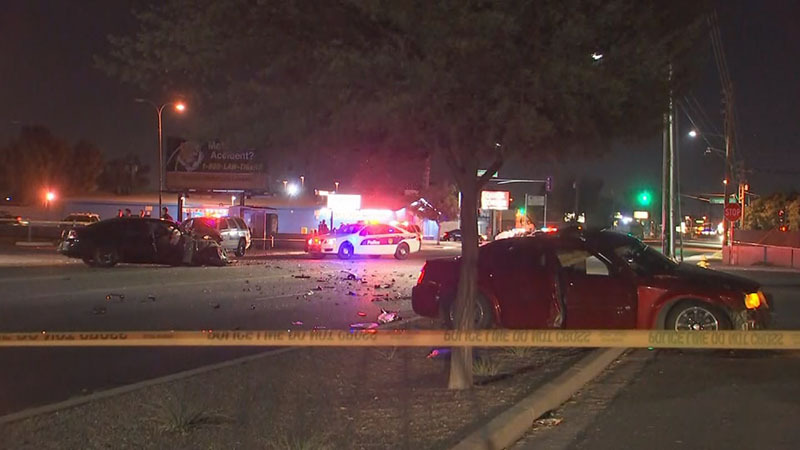 Phoenix, Arizona—An accident in central Phoenix left one person in critical condition and two others with serious injuries early Monday morning. Phoenix Fire Department emergency responders were on the scene at 27th Avenue and Campbell Avenue. Investigators have not yet pieced together the sequence of events leading up to the crash. Firefighters had to extricate two people trapped inside a Chrysler 300. The driver suffered a critical head injury, but is expected to recover. The passenger is in serious but stable condition. Police report that the female driver of the other vehicle, a black Dodge Charger, suffered a broken femur. Impairment is not considered to be a factor contributing to the accident. 27th Avenue was closed in both directions at Campbell Avenue while police and fire crews worked the scene. Accident investigators have not released the names of any of the victims as the investigation continues. There is no word on whether any citations have been issued. No additional information presently is available. We wish swift and full recoveries to the victims of this accident.